Pomegranate is packed with health benefits. For many millennia, pomegranate was used in the East for medicinal purposes. Pomegranate juice contains many healthy substances like Gallic acids, antioxidants such as ellagic and anthocyanin acids & flavonoids such as quercetin. These substances protect the body against many diseases, whilst beneficial for skin care. Different studies were conducted which revealed encouraging results. One study found that pomegranate juice slowed down the rising rate of PSA (prostate specific antigen) levels – PSA doubling time and in men where prostate cancer was recurring. A longer period in PSA-doubling time is an indication that the cancer might be advancing at a slower rate. Another study revealed that with the daily intake of 237 ML (8 ounces) of pomegranate juice by men who had radiation or surgery for prostate cancer, the doubling time of PSA was remarkably longer. Other research showed that in a laboratory environment, some compounds found in pomegranate juice, have the ability to restrict prostate cancer cells from growing. However, at this stage whilst such results are promising, they are just exploratory and additional clinical trials will be done. The intake of pomegranate juice may assist diabetic people to reduce the chance of developing heart disease. In a new preliminary study it was found that diabetic people who consume pomegranate juice for a period of 3 months had a much lower chance of developing atherosclerosis. In a study conducted in Haifa, by Michael Aviram, associated with the Haifa Faculty of Medicine in Israel, it was discovered that sugars are found freely & in harmful forms in most juices. 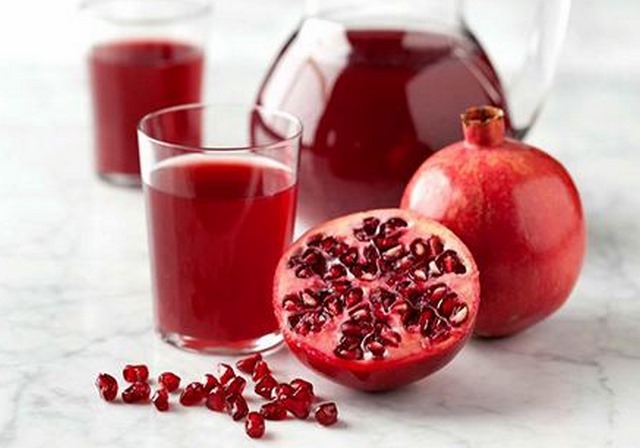 However, sugars contained in pomegranate juice, are associated with unique antioxidants which make such sugars to be protective against developing atherosclerosis. Despite the fact that pomegranate juice has the same level of sugars contained in other fruit juices, it was found that the pomegranate’s sugars did not worsen blood sugar levels in the diabetic participants. Does Pomegranate Juice Lower Cholesterol? According to smaller studies it seems that consuming pomegranate juice may has the ability to lower cholesterol levels. It’s also the opinion that pomegranate juice might be able to slow down or block cholesterol’s build-up in individuals’ arteries, prone to have a higher chance to develop heart disease. Antioxidants are contained in pomegranate juice just like other fruit juices, in particular polyphenols. Pomegranate juice has higher antioxidant levels compared to other kinds of fruit juices. The opinion is that antioxidants provide various benefits which protect the heart which include decreasing LDL (low density lipoprotein) or bad cholesterol. Consult with your doctor before you start to consume pomegranate juice as a supplement. It may interact with some prescription medicines, like warfarin (Coumadin, Jantoven) which is a blood thinner as well as ACE-inhibitors (angiotensin-converting enzyme) like Capoten (captopril), Prinivil & Zestril (lisinopril) and Vasotec (enalapril).